I was drawn to this children’s book because I loved Anderson’s previous book, Ms. Bixby’s Last Day. I was not disappointed. Among other talents, John Anderson really gets into the minds of middle-school children – in this case, both boys and girls. And they are no angels! He describes their way of seeing the world with compassion and humor, not to mention realism. But it’s all in service of some very, very important themes. The theme in this children’s book is put forward subtly, deftly, but unmistakably – bullying, and the way words can be weapons. 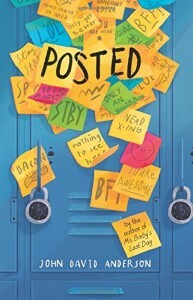 Given the theme, I can’t recommend it highly enough for middle-school classrooms, especially if bullying becomes an issue. However, in this particular iteration, the bullying comes across in a subtle way…it builds momentum, so that I didn’t really see it coming in the very dramatic climax, that brought tears to my eyes. Along the way, Anderson offers a number of insights into wise and compassionate speech, the importance of loyalty, being true to oneself, gender issues, and the heartbreaking truth that everything changes, including our closest friends. I couldn’t put this book down until I knew how it ended. I’m so glad the author has gone out on a limb to offer a book in today’s world where we seem to tolerate bullies, and abusive speech, in every form.